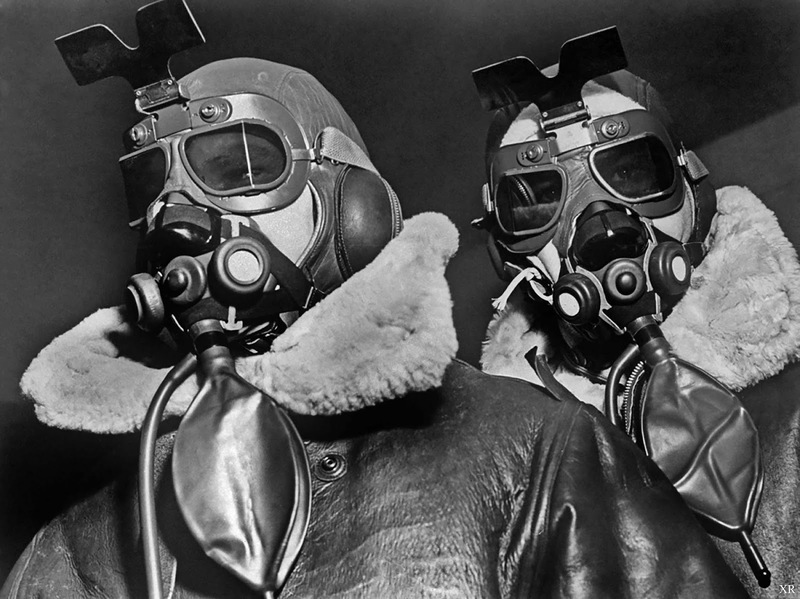 Two fliers of the 8th Bomber Command clad in high altitude flying clothes including sheepskin coats & helmets, oxygen masks and sunglass goggles, at airdrome in southern England. During World War II, the now-legendary VIII Bomber Command (often referred to as the Eighth Air Force) served as the principal American force assembled to attack Germany from the air. For several critical years in the early and mid-1940s, B-24 and B-17 bombers—the Flying Fortresses—from the “The Mighty 8th”, often in tandem with Royal Air Force fighters, crossed the Channel and hit strategic towns and cities in Nazi-held Europe. First crewman is wearing the RAF Type B flight helmet (famously used during the Battle of Britain), the second crewman is wearing a USAAF B-6 type shearling helmet. The mask is an early A8-B type used by bomber crews mostly from before the war up to about 1943 when it was phased out by more modern systems. The A-8B was a constant flow oxygen mask, patterned after the original design by Boothby, Lovelace, and Bulbillion (the mask was originally known as the BLB mask). It covered the mouth and nose and also had a rebreather bag attached to concentrate the oxygen for enrichment. Both crewmen wear the famous B-3 type shearling jacket. Aviators in WWII bombers came to rely on their B-3 jackets as they often flew for 8-9 hours in unpressurized cabins, where air temperatures could drop to more than 60 degrees below zero (-53 Celsius). The bomber was vital to the crew’s comfort as the crimp of the sheep’s wool created insulating air spaces, naturally retaining heat and absorbing excess moisture generated by the body. It remains one of the warmest and most insulating bomber jacket ever made. Both crewmen also are sporting RAF type MK VII goggles with flip down sun visors. The use of RAF equipment was common among aircrew, especially early in the war due to either shortages or inadequacies of the issued gear. Fighter pilots especially favored RAF helmets, oxygen masks, and life preservers due to how much more comfortable they were. (Photo credit: Margaret Bourke White / LIFE Magazine).